Where is your notes.ini? Well, it is usually located on your Notes programm directory. That is where your notes.exe resides. You should close Notes before you update your notes.ini! This notes.ini parameter corresponds to the NSF_UPDATEODS parameter. It tells Notes to create new databases using ODS51. 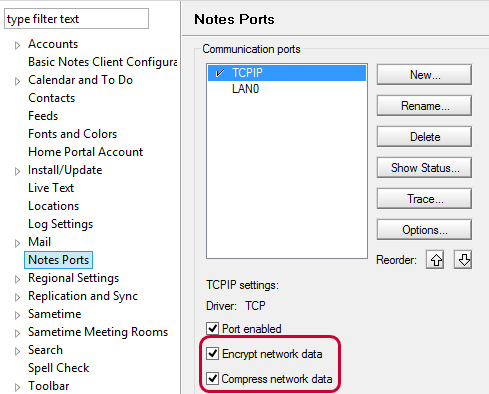 Enable the 2 options for the ports you are using. Please check with your administrators that the options are enabled on your servers as well. Otherwise enabling these options in your local settings might have the opposite effect of what you want to achieve. Your network connections will slow down instead of speeding up. Encryption is rather a safety feature than a performance feature. Since encryption takes place on your machine and not in the network wire, it will most likely not slow down your performance unless you are riding a really old horse. If you’re sure that security is good enough within your network you can as well deselect this feature. Use it when parts of your connection uses the internet! Now here’s a real showstopper! All anti-virus and anti-spam systems today have some live scanner facility that check files when they are being accessed. That means that every Notes database and all jars and … files Notes uses are constantly being scanned. This costs lot’s of performance! A simple change in your anti-virus software will provide you with a brand new IBM Notes experience! Since I am using Microsoft’s Security Essentials I show you how to exclude Notes from your scanner in this software. 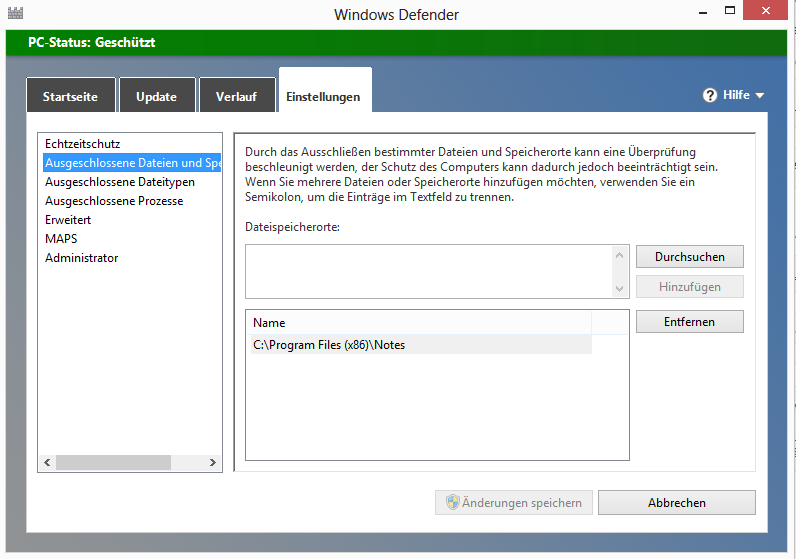 OK, open the Security Essentials by opening the program „Windows Defender“. Just use your Windows start button and type „Defender“ (If you are already on Windows 8, enter metro and start typing). If you do not want to exclude the entire directory than I urge you to exclude all databases at least. To do this open „Exclude file types“ in the left navigation and add „*.nsf“ and „*.ntf“. These settings will improve the performance of your client a lot and you will experience a new IBM Notes feeling. You might not fall in love with the product but the amount of swearing and yelling will drop and your colleagues will be thankful.